Since the releasing of Eleaf Invoke with ELLO T, it has attracted millions of vapers’ attention with its fashionable design and impressive performance. 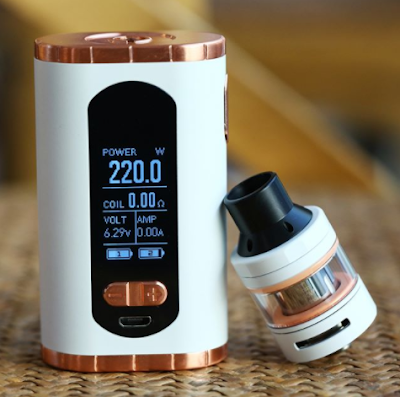 As a wonderful upgrade of Eleaf iStick Pico Kit, it is certain to interest the fans of Pico and going to be a market hit. Consisting of the Eleaf Invoke mod and the ELLO T atomizer, the comb kit houses dual 18650 cells, able to produce a max output of 220W while it still retains a relatively small size. As for the mod, it features a super large 1.3 inch front-facing display screen which enables us to check the data more easily and clearly. As for the ELLO T atomizer, it introduces HW Series Coil which is perfect for high power vaping. Comparing with the Pico, Eleaf Invoke with ELLO T kit is more powerful with larger watt. What’s more, the pico places the fire button on the side of its body and 510-connector alongside the battery bay while Eleaf Invoke with ELLO T make a little change by placing the 510-connector on the top of the device, which also make it possible for the handling of atomizers up to 27mm. If you are a pico fan, you can not miss it. And you can also purchase one as a back-up for it has a rather long battery life which can sustain you vaping whole day.